Major scale has 7 tones. We try to make chords with only major scale tones. 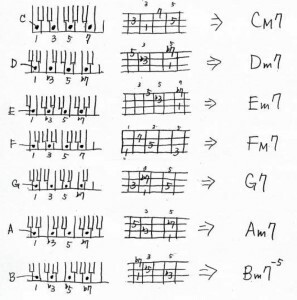 Beginning each tones, we can make 7 chords. In this lesson, we think chords composed of 4 tones, in C major scale (white key of piano. CDEFGAB). We can make 7 chords above. As A natural minor scale has the same tones as C major scale, we can make 7 chords from A natural minor scale. These chords made from major scale or natural minor scale are called “Diatonic chords”. Let’s try to remember diatonic chords of major key. For your infomation, these above are composed of 4 tones. 3 tones chords are following. Remember diatonic chords of major key (4 tone chords).